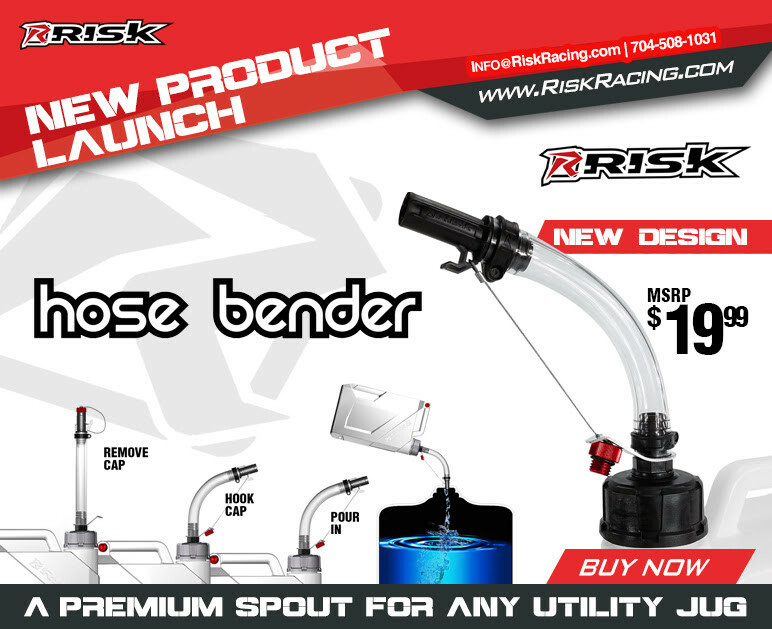 Say hello to the latest evolution of the RISK Racing Hose Bender! The new and improved Hose Bender will continue to offer all of the same innovative features as its predecessor, including the cap with lanyard to create a natural bend to the hose, and the much-loved and adored stability hook that helps to balance your jug while pouring. RISK is retaining these key features while beefing up the design in order to deliver the coolest spout on the market! The new Hose Bender now includes a CNC anodized aluminum cap, which offers a threaded design and an O-Ring seal to prevent leaks. RISK took the design a step further with a new compression flange and O-Ring seal where the spout threads into the jug, preventing any leaks between the spout and the can. This beast of a spout is constructed from HDPE Plastic ensuring it is chemical resistant and durable. If you are looking to get set up like a boss, combine the new Hose Bender with the EZ3 Jug and Mount, then sit back, relax and bask in all the glory of a job well done.